Party On, Dane | Arts and Culture | Style Weekly - Richmond, VA local news, arts, and events. With neon and palm trees, Sören Hüttel celebrates kitsch without irony. 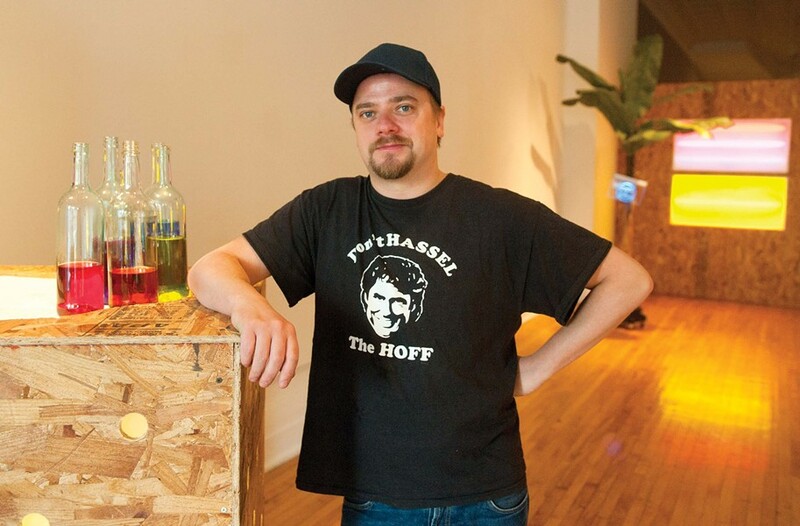 Artist Sören Hüttel takes a break from installing his party-inspired work at 1708 Gallery. Sören Hüttel notes that eclectic isn't a word often used in his native Denmark, but in English it's employed all the time to connote a sourcing of ideas, images or materials from a diverse range of time periods and tastes. In essence: anything goes. Hüttel has made eclectic vignettes the basis for his artistic body of work. And his tastes and derivations come from very specific places. He likes disco, the bar and club scenes, and other aspects of kitschy nightlife culture that pervade the world — from Scotland, where he studied art, to Miami, where he embarked on a cruise last summer. This tropical adventure inspired the exhibition at 1708 Gallery, his first solo show in the United States, called "Space Time Colour Eclectic." He makes it a point to clarify: "The tackiness ... I embrace it. It's not ironic." Hüttel also is interested in seemingly oppositional elements coexisting in one space, a concept which, in this exhibition, is put into practice with sophomoric simplicity. The gallery is divided so that the front entrance has become a smaller, cluttered space full of bright color, neon lights, mirrors and faux bar bottles. A viewer sees closed window blinds with neon light bleeding through, a palm tree with the neon message "Cocktails & Dreams," and a floor-bound disco ball chained to a pedestal, all with a looping bar soundtrack replete with Bonnie Tyler's "Total Eclipse of the Heart" and the Bee Gees. The rear of the space is large, airy and painted gray, with a handful of small white models in various shapes and forms. Now the scene is subdued and sparse, with just a hint of music bleeding over the background. There is a Hopper-like miniature urban building with a lonely neon light reflected in its window, the sole color in the room. There are silver balls, white blobs, and a framed paper on the wall reading "Very Cool White." Hüttel's artistic vision has the strength of continuity from project to project. You can tell a Hüttel scene is a Hüttel. His ideas are riffs on philosophical and art-history contexts, such as an earlier show, "Eclectic Is Now," which responded to painter Barnett Newman's iconic mid-20th-century essay "The Sublime Is Now." Unfortunately, this all ends up feeling like that thing you want to wash off in the morning after getting drunk at the club. The superficiality, excess, materialism, boredom and general hedonism evident in "partying," as Hüttel calls it, being elevated in an art-gallery context, makes a disturbing comment on the state of art and our culture in general. Damian Hirst and his garish art hype come to mind. Sören Hüttel's "Space Time Colour Eclectic" will be on view at 1708 Gallery until Dec. 8. For information visit 1708gallery.org or call 643-1708.